KEVI is the classic office chair with the hard-wearing principle: The better you sit, the more you get done. 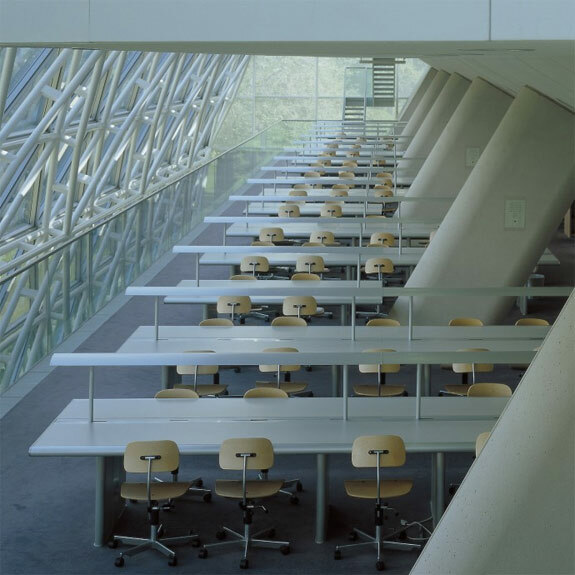 Designed in 1958 by architect Jørgen Rasmussen and suitable for homes, offices, schools and workplaces where one solution must satisfy many demands. Everything is visible, nothing is superfluous: seat, back, base, and controls. A simple well-balanced formula that incorporates aesthetic appeal with freedom of movement plus the flexibility you would expect from a full-service program. 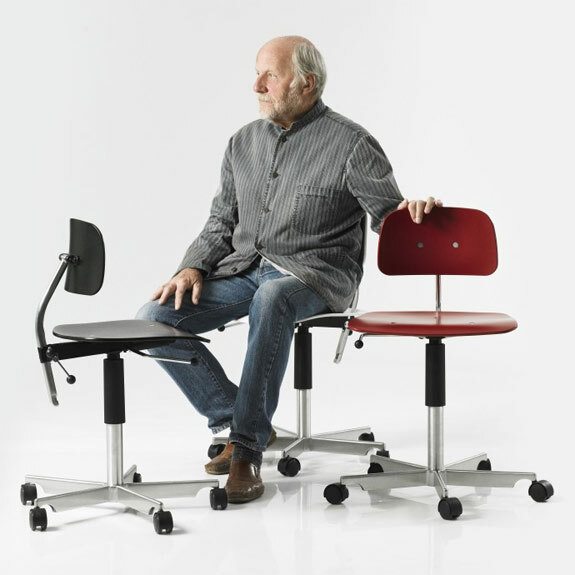 The Kevi 2003 office and work swivel chair has a seat and back made of 9 mm compression molded plywood. The five-legged base comes with glides or castors, with or without brakes. The chair has an automatic height adjustment. The base is satin polished aluminum and the seat is available in beech wood or 9 different painted colors. The swivel chairs in 3 exceeding heights come with a satin polished aluminum foot ring. 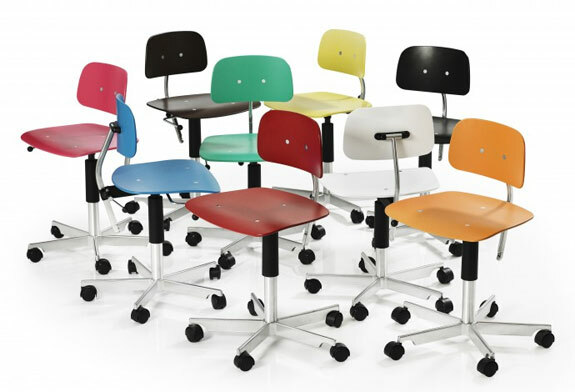 Kevi is made of moulded plywood seat and back, satin polished aluminum base with black castors or glides. It is available in white, black, brown, orange, blue, pink, green, yellow, red and natural beech (with clear lacquer). “Why is the chair named Kevi?Because the first chair was designed for a company called Kettel & Villadsen. Villadsen was the manager and he had problems with his back. In those days there weren’t so many pieces of furniture that cared about that. Money was a bit tight, so every little part was tossed and turned and reused from one chair to another, which is not necessarily a process that is harmful to the finished product. Kevi had taken over a line of Swedish office furniture with chrome bearings in folded sheet metal. My brother and I were architects so we started with the base and continued upwards with new seats, backrests and controls. The chair for kids came with our own children. Quite a lot of people have been sitting on a Kevi chair for most of their lives. It sounds like an organic design process. Today design is a label you stick on a lot of useless junk to be sold as Christmas presents. If you ask me it’s about making a product useful and payable. Some of the best designs have never been in the hands of a designer, but have been refined through generations. Is there no good news? I have an iPod, a small white wonder that is quite fantastic. But idiot-proof it is not. I’m looking forward to the day when you sit back and talk to your computer. I have noticed that some manufacturers have begun to make chairs with nets to avoid sweat on your back at the end of a long day. That is good thinking. Are you making product development now? With all the new materials and techniques you should never rule out anything. But don’t expect news for the sake of novelty. I’m well aware that there are companies that churn out collections as if they were in the fashion industry. Fashion, mind you, is that which goes out of fashion. Do you have a favourite version? If I do, I will never tell you. But I do think that it’s quite interesting that people like Norman Foster and the Danish Design School keep coming back for more Kevi chairs. Like this chair, and thanks for all the information! What a surprise and fun read. And I’m so lucky to own several teak I believe finished drafting height Kevi chairs. Bought new if I recall correctly.